A group of Ethiopians arriving in Obock, Djibouti. From there, many take boats across the Gulf of Aden to Yemen. “I met teenagers in utter distress from what they had experienced already in their young lives,” said Mohammed Abdiker, Director of Operations and Emergencies at the International Organization for Migration (IOM), following a visit to Yemen this past week. The total number of migrants currently in Yemen is unknown, but nearly 100,000 arrived in 2017. Migrants often leave their homes on foot and walk through Djibouti. From there, they take boats across the Gulf of Aden to the Aden, Lahj, Shabwah, and Hadramout Governorates in Yemen and then attempt to head north to the border with Saudi Arabia. Some take irregular work in Yemen to make money to fund the rest of their journey while others get caught up in the on-going conflict between the Saudi-led coalition and Houthi rebels, sustaining injuries - or dying in crossfire. Some also end up in detention centres. At various stages of their journey, these migrants face the risk of being exploited by ruthless smugglers and other criminals, including enduring physical and sexual abuse; torture for ransom; arbitrary detention for long periods of time; or grueling forced labour, without wages. Last August, scores of Ethiopian and Somali teenagers dreaming of a better life were forced into the sea by smugglers off the coast of Yemen and drowned. In 2017, IOM helped some 2,900 migrants and refugees return home from Yemen: 73 per cent of them were Somalis, 25 per cent Ethiopians, and 2 per cent other nationalities. This year so far, IOM has helped 197 Ethiopians - together with 939 Somali migrants and refugees - return home voluntarily. “Yemen is experiencing the worst humanitarian crisis in the world; it is obviously not a safe route for migrants, nor is it safe for Yemenis themselves in many areas,” said Mr. Abdiker. He said that more and more Yemenis who have fled, are returning from Saudi Arabia due to tightening regulations there. Both migrants coming to Yemen, and Yemenis returning home, are in desperate need of greater support from the international community, and “neither group should feel forced to transit through or return to a conflict zone,” he added. 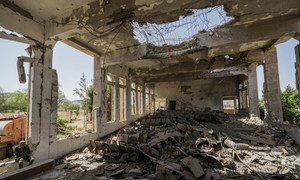 The new United Nations envoy for war-torn Yemen called Tuesday for all parties to the conflict to abandon preconditions and begin negotiations, and said he would offer a new framework for talks within the next two months.